I ran four lengths of track down the hallway, loops in both bedrooms and around the dining room table, and totally filled the living room with tracks going in circles. Then I got out all SIX of my locomotives, and ran them at the same time. I quickly overloaded my ten amp DCC power supply, so I put one locomotive away and ran the other five successfully. Looks like it’s time for me to buy a second ten amp DCC power supply! 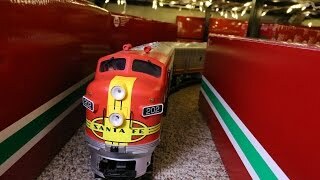 I attached a GoPro Hero5 Session on to the top of my favorite locomotive, the Santa Fe Super Chief diesel passenger train, and got some interesting video of all the trains running on this indoor layout on a cool and cloudy day that wasn’t conducive to taking the trains outdoors. There are two Piko steam trains running on the layout, a small LGB Porter steam train, the LGB Santa Fe Diesel, and a LGB White Pass & Yukon Route railroad train. These G-scale model trains are significantly larger than the tiny HO scale trains which are most popular in model railroading today.